Activist Tommy Robinson has told the #DayForFreedom free speech rally in London that he’s taking Twitter to court, to prove the social media giant is treating “facts” as “hate” at the behest of a censorious British government. 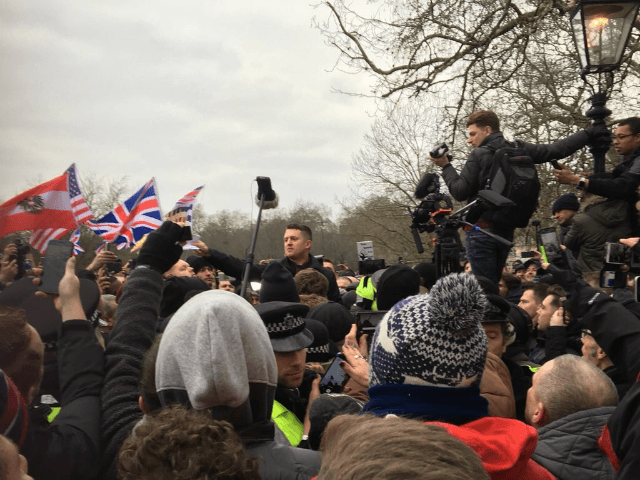 Robinson was introduced by Breitbart London editor-in-chief Raheem Kassam, who gave a short speech thanking the police officers on duty at the event, as well as the Antifa activists and mainstream media reporters who had shown up. “Let’s have the arguments — because we can win the arguments; we are winning the arguments here today!” he told the cheering crowd. Greeted by chants of “Oh, Tommy, Tommy! Tommy, Tommy, Tommy, Tommy Robin-son”, the activist said it was “unbelievable” to see so many people out supporting freedom of speech. “The people of this country have been silenced for twenty to thirty years with the tag of ‘racist’,” he said. “They have managed to silence people so they’re too scared to speak up when they see things that are wrong. “They’re too scared to tell the truth and identify problems with an ideology and a religion in our country, because they’re worried about being called ‘racist’. “[The establishment] now realise that tag is dead. No-one cares anymore about being labelled as a ‘racist’. “So they’ve now introduced their new term: ‘hate speech’. What is ‘hate speech’?” Robinson demanded. Robinson cited the case of a 16-year-old boy who went to Speakers’ Corner, a traditional haven of free speech in the British Isles, to debate Muslim street preacher Ali Daweh. “He stated facts about Islam, and he was visted last week by counter-terrorism officials from the Prevent strategy,” he claimed. Robinson warned that these “scare tactics” worse, and that once people say one young lad visited by counter-terrorism officers for criticising Islam, others fall silent. He also took social media giant Twitter to account for removing him from the platform for pointing out the overrepresentation of Muslims among child grooming gangs, and violent verses in the Islamic holy book. Robinson said that 10,000 accounts on Twitter have been closed at the request of Government for hate, compared to 140 which have been closed for terrorism. “Where we’re heading, Facebook, YouTube, will all remove our views,” he said, telling the crowd about a video he had seen of Yvette Cooper MP, a former Government minister and senior Labour politician, pressuring YouTube bosses to make sure Robinson’s videos are not promoted. “This is Government interference with private companies to remove certain people’s views, which is fascism,” he blasted. “What I’m going to do, is I’m going to take Twitter to court,” he declared.